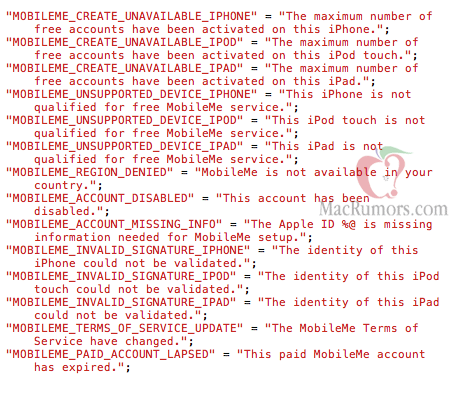 Apple to Offer Free MobileMe Service to Some iOS Users? Earlier this month, we noted that the original golden master version of iOS 4.2 appeared to be preparing to allow users to sign in to MobileMe using their Apple IDs and even offer users the ability create a free Apple ID right from the MobileMe settings page in iOS. At the time, we cautioned about reading too much into the change but speculated that Apple could be looking at bringing some of the features of the paid MobileMe service to a new free offering tied to users' Apple IDs. At a minimum, it appeared that Apple was looking to create a consolidated login to allow MobileMe users to access features with their Apple IDs. New evidence uncovered in recent iOS 4.2 builds and the iOS 4.2.1 golden master seed is suggesting, however, that Apple will be offering a free MobileMe tier to users. The evidence comes in the form of a new private framework known as AppleAccounts.framework that includes a series of device-specific error messages referring to free MobileMe accounts. In particular, the error messages include alerts regarding having reached "the maximum number of free accounts" for a given device and certain devices not being "qualified for free MobileMe service". "This Apple ID cannot be used for MobileMe Mail, but you can use it for other MobileMe services." Other MobileMe iPhone services include Find My iPhone, iDisk, Contact/Calendar/Safari/Notes over-the-air sync, and Photo Galleries. This might fit nicely with a previously unconfirmed rumor that Apple would begin offering MobileMe syncing services for free. Over-the-air syncing has been an area where iOS has lagged in comparison to Google's Android operating system.